Jack Nicholson is a legendary American actor, who has been one of the biggest stars of Hollywood for close to 6 decades. Nicholson began his acting career as a stage actor and then became a B-movie star. It all changed after he delivered the screenplay for the movies ‘The Trip’ and then managed to get a role in the film ‘Easy Rider’. As of 2019, Jack Nicholson’s net worth is $400 Million dollars, and he is one of the richest actors in the world. Jack Nicholson was born in Neptune, New Jersey on the 22nd of April, 1937. Nicholson grew up with his mother’s family and his grandparents treated him like their own child. He actually thought that his own mother was his elder sister. Nicholson lived in Neptune City for some time in his childhood. He attended Manasquan High School and he was often trouble in school. Jack Nicholson always wanted to be an actor and he had his first assignment as an actor with the Players Ring Theatre in 1957. He managed to get some roles for B-movies and small parts in television. Following his work as a stage actor and appearance in low budget films, he though his career as an actor was finished. In 1967, he wrote the screenplay for ‘The Trip’ which was released in 1967. Two years later Nicholson got his big breakthrough when he was cast in the movie ‘Easy Rider’. In 1989, Jack Nicholson appeared in a role that would come to be one of his best movies of all time ‘The Shining’. He portrayed the role of ‘The Joker’ in the movie ‘Batman’ which was released in 1989 and the film was a resounding success. Nicholson played the role of a deranged gang boss in the 2006 film ‘The Departed’ starring Leonardo Di Caprio and Matt Damon. His portrayal of ‘Frank Costello’ earned him a Golden Globe nomination. As of 2019, Jack Nicholson’s net worth is $400 Million dollars. In About Schmidt, Jack Nicholson plays an insurance actuary named Warren Schmidt who, upon retirement, can’t seem to find any personal significance in his life. He spends the movie trying to repair some of his broken relationships with family members and while he appears unsuccessful, he ultimately finds discovers his satisfaction from an unlikely source. Unlike Warren Schmidt, Jack Nicholson’s character (Melvin Udall) in As Good as It Gets doesn’t seem to be interested in other people at all. He is a successful author who suffers from OCD, mysophobia, and a general disdain for other people. When an unlikely event ends up pairing Melvin with his artist neighbor and the waitress at his local café for a trip to Baltimore, he learns to make connections with people and show that he really cares for them. It’s important to remember that we have to stand up for those who can’t. We have to fight for those who can’t fight for themselves to make the world a better place. Jack Nicholson is one of the greatest actors of all time. Nicholson has collaborated with some of the most incredible actors such as Morgan Freeman, Tom Cruise, and Demi Moore. As of 2019, Jack Nicholson’s net worth is estimated to be $400 Million dollars. 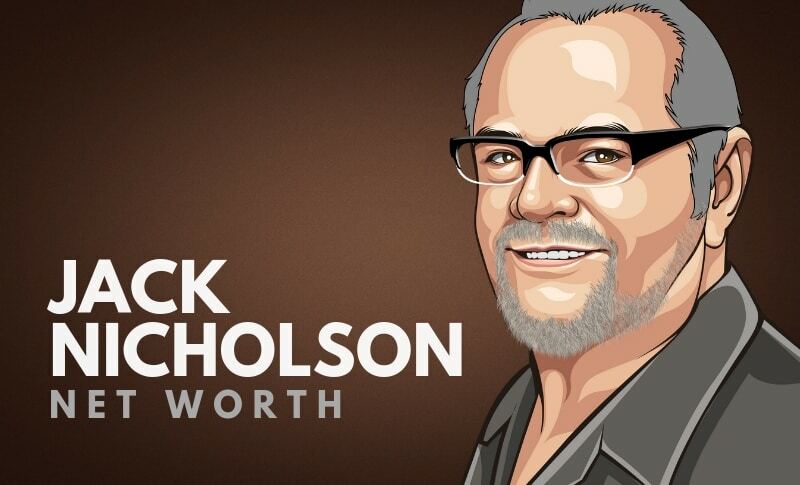 What do you think about Jack Nicholson’s net worth? Leave a comment below.